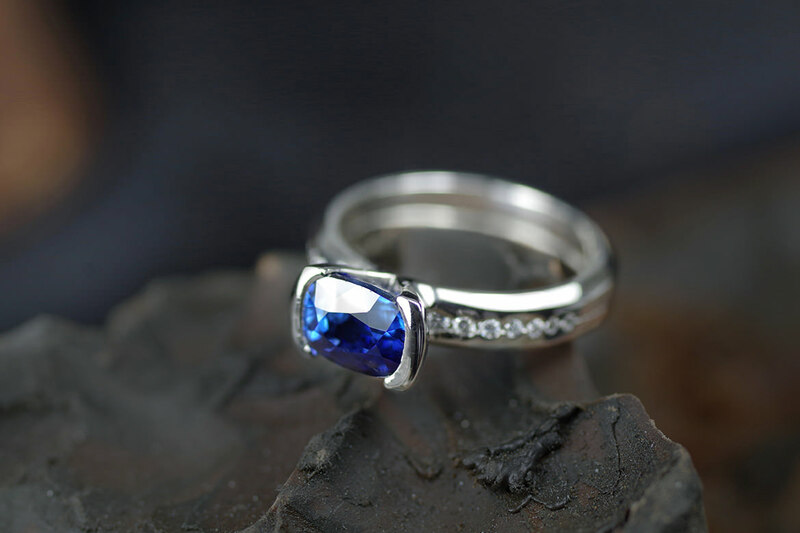 Platinum ring set with one 2.13ct rich blue cushion cut Sapphire & fourteen flanking brilliant cut Diamonds. 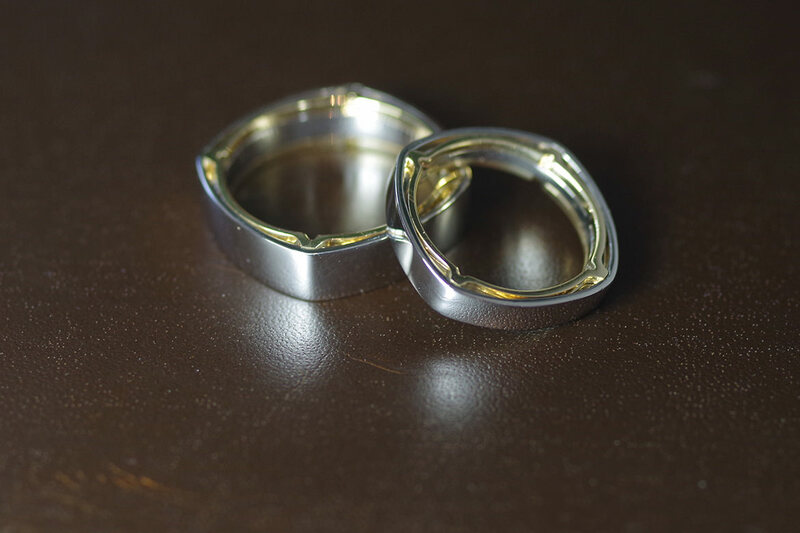 Palladium rings with 18ct yellow Gold side detailing. High Palladium 18ct white Gold ring set with one 0.53ct Radiant cut Diamond and twenty two flanking brilliant cut Diamonds. This is a CAD image. 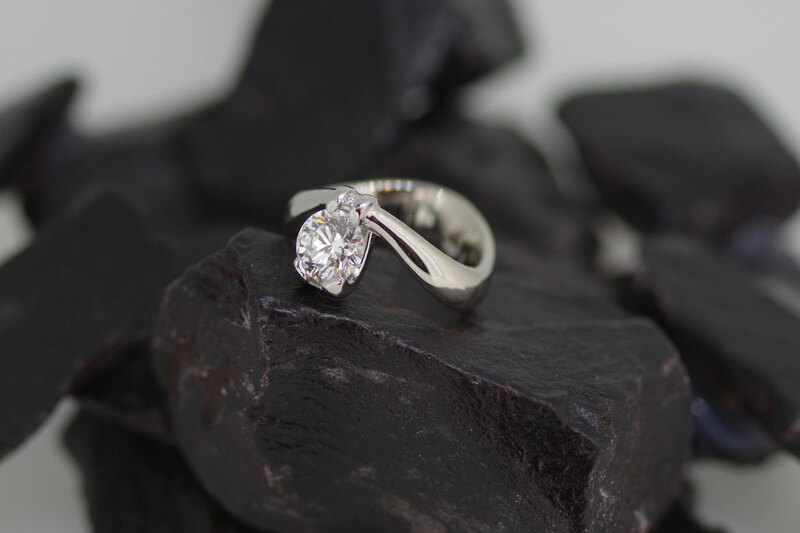 18ct white Gold ring set with one 0.35ct pear cut, three marquise cuts and three brilliant cut Diamonds. This is a CAD image. Platinum ring set with 0.62ct cushion cut Diamond with flanking princess cut Diamond. This is a CAD image. 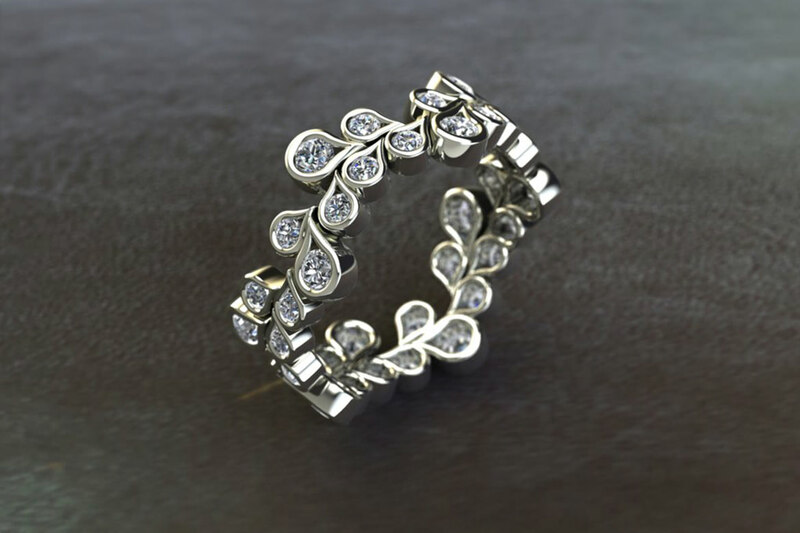 Palladium cluster ring set with six brilliant cut Diamonds. This is a CAD image. 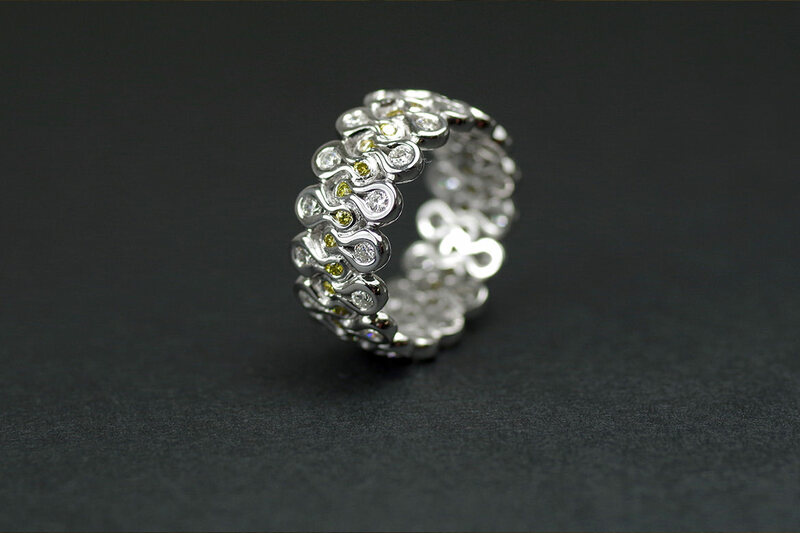 High Palladium 18ct white Gold ring set with thirty two 1.8mm white brilliant cut Diamonds and thirty two 1.3mm yellow brilliant cut Diamonds. 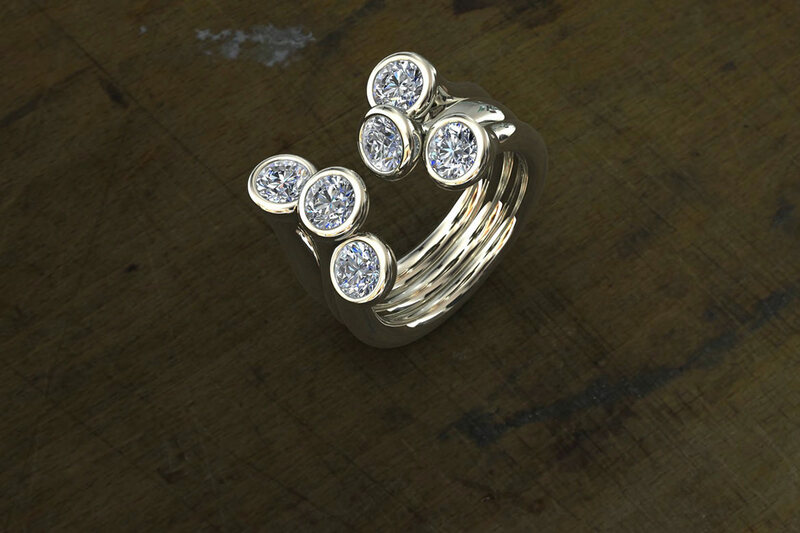 Hight Palladium 18ct white Gold Dot ring set with ten marquise cut Diamonds & fifteen brilliant cut Diamonds. 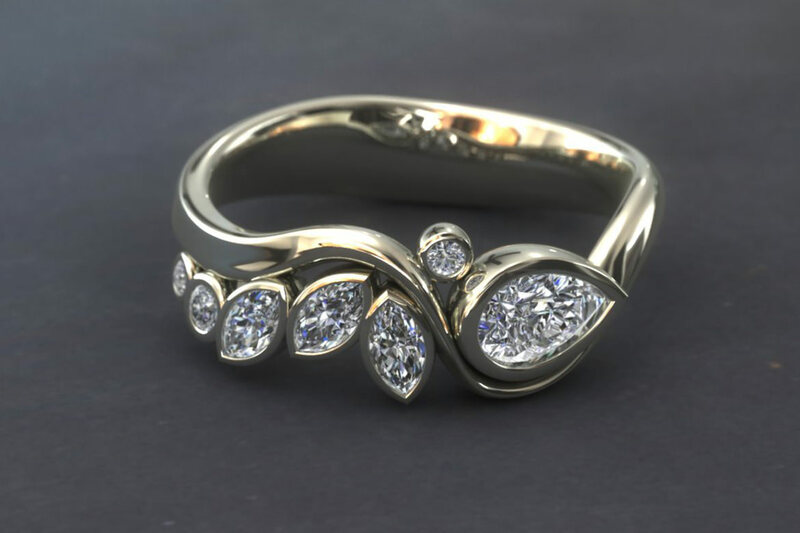 The ring pictured with fitted 18ct yellow Gold ring. 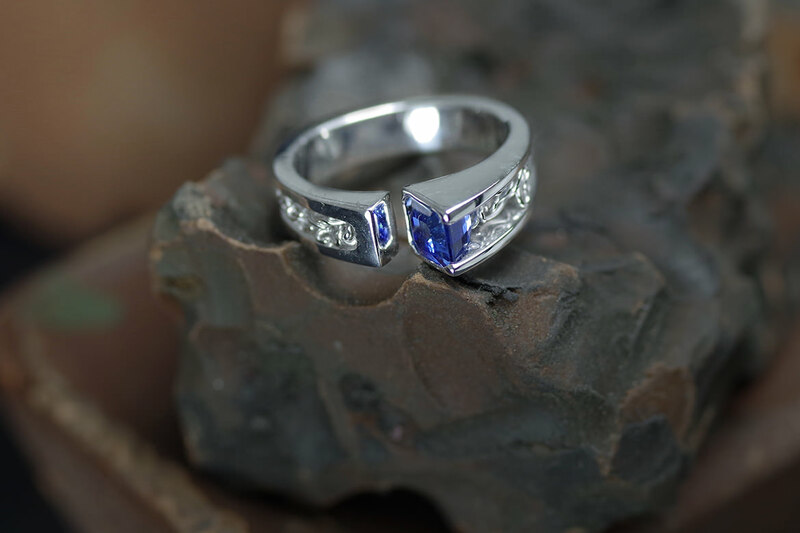 Mirror style ring set with one 1.19ct Octagonal square cut deep rich blue Sapphire in high Palladium 18ct white Gold ring. 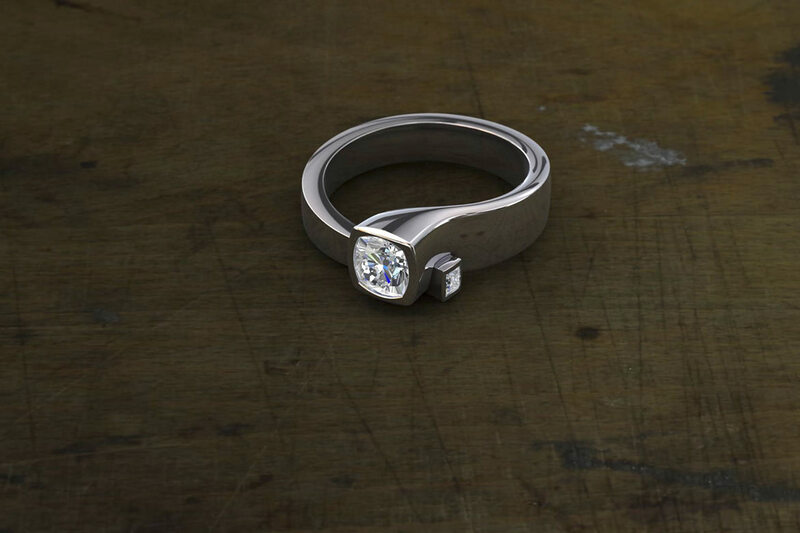 Platinum ring set with one 1ct brilliant cut Diamond and eight flanking princess cut Diamonds going under the setting. 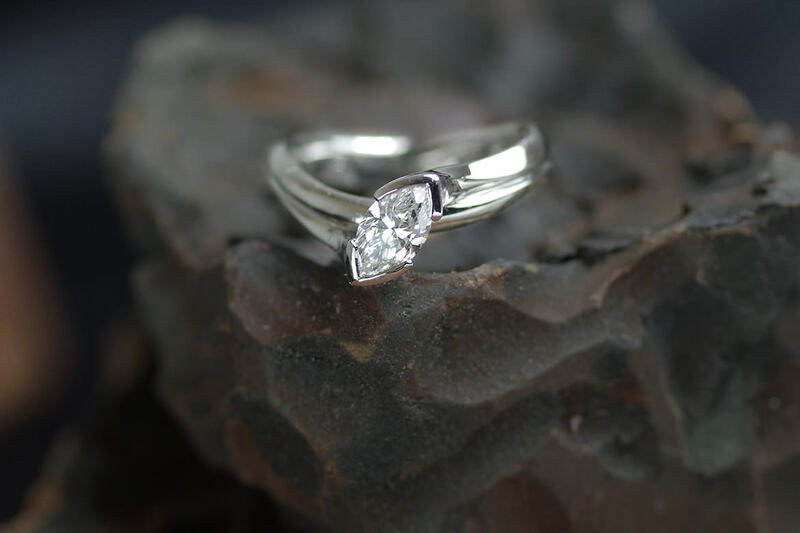 Platinum single stone ring set with one 0.46ct marquise cut Diamond. 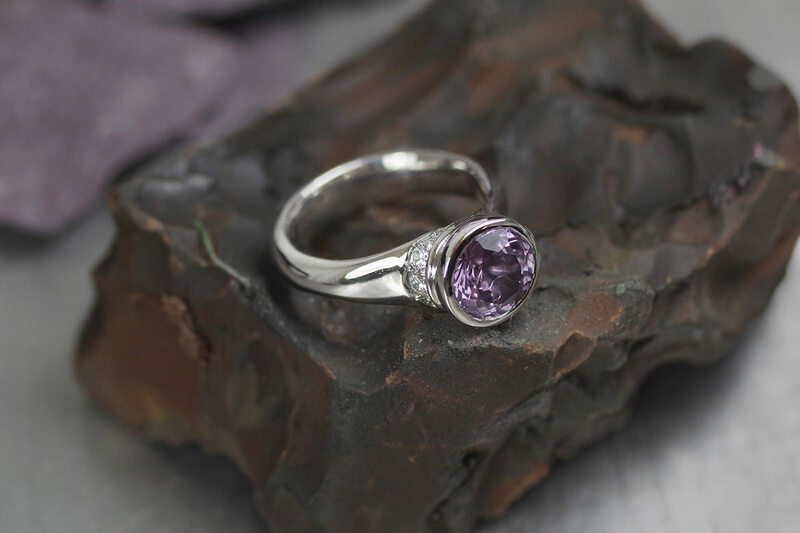 Palladium ring set with one 2.73ct purple Spinel (Direct supplied gem from Rubyfair) with nine flanking brilliant cut Diamonds. Dot specialises in creating jewellery as individual as you are. If you have an idea, we can transform it for you into something truly original. What is it possible for us to create for a client? On the whole, most design requests can be developed and all will result in a very beautiful and personal piece of jewellery. 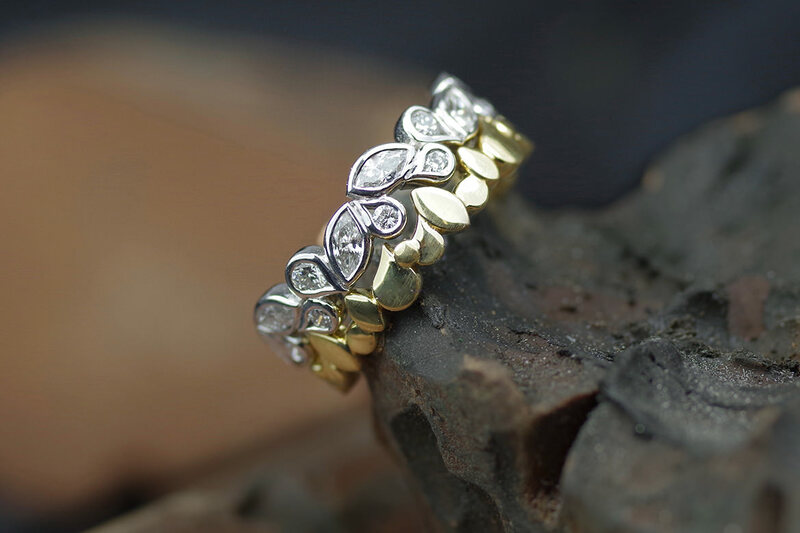 We’ll listen to your preferences and combine them with our inspiration and know-how, to produce jewellery that both fits you comfortably and perfectly suits your particular style. 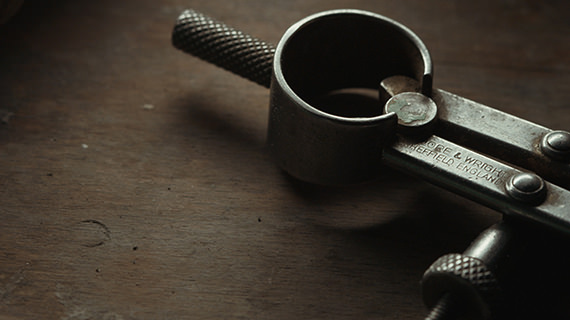 If you would like to commission a piece of jewellery, we have a simple five step guide. 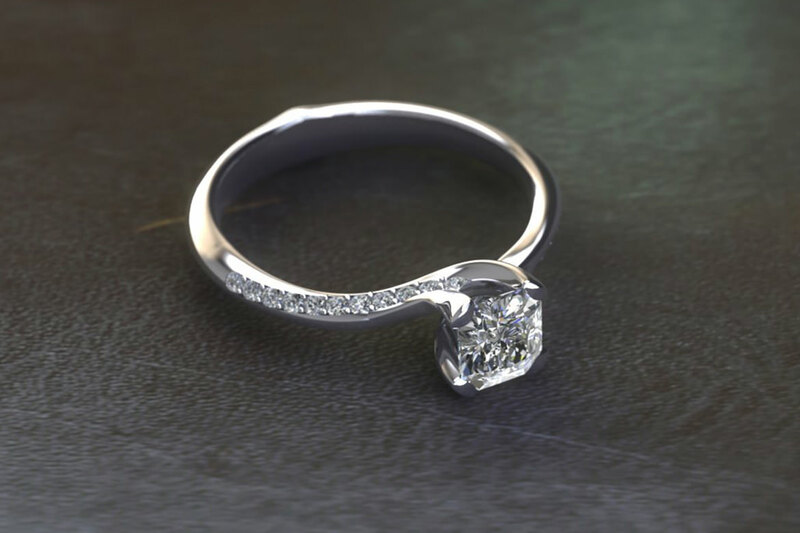 We’ve taken advantage of new technologies available to allow international clients to develop individual pieces of jewellery with us without having to meet us in person. As long as you have a postal address and an internet connection, you can order from Dot the Jewellers. Please contact us for more information. Do you want to commission a piece of jewellery as a surprise for someone? Does the idea make you nervous because you’re worried they might not like it? We have a solution - Dot the Jewellers offer a Commission Card service, which lets you give a gift of bespoke jewellery while allowing the recipient to contribute to the design of the piece. This is suitable for any special occasion, from birthdays, to anniversaries, to holiday gifts – it can even be a good way of proposing! 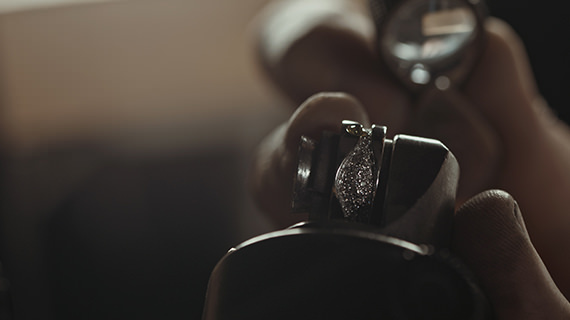 The price charged by Dot for a piece of jewellery takes into account design time, manufacture time and materials used. It can be difficult to give an estimate of the likely cost of a finished piece of jewellery as there are so many variables – what metal? what stones? what size? how complicated? For this reason, we always start by having a good chat with a prospective client. This free face-to-face discussion usually follows an exchange of information by email, and serves to give us an idea of what you are looking for and what your budget is. Our starting price is £950 which is determined by the minimum amount of time it takes to develop designs. The price then naturally increases based on which materials you choose for us to use in your design.